Backup and Restore operations are important part of the database administration. 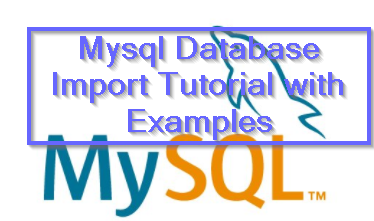 mysqlimport command is used to load data in file into Mysql or Mariadb servers. Mysql import is generally used by providing SQLfile. Syntax of mysqlimport is like below. The first example is simply importing the data file into mysql database. We will provide the username with -u and insert into database name students the sql file named newstudents.sql . We may need to provide the password for the user. We can use -p option to provide the password. In this example we will use user ismail and provide password interactively. Another practical way to provide password is batch mode. But keep in mind this is a security violation for the most of the situations. We will provide the password in cleartext with -p option. In this example the password is sosecret . We can use mysql shell in order to import sql files. In order to use mysql interactive shell for sql file import we should open the shell. LEARN MORE How To List MySQL / MariaDB Database? and then we will select the database we want to import given sql file. and the last step is specifying the sql file with \. operator. The SQL file must be in a compatible format in order to complete import operation successfully.